The S157 CO2 Analyzer is a single channel non-dispersive infrared CO2 analyzer that measures CO2 in 0 to 2000 ppm range with 1 ppm resolution. 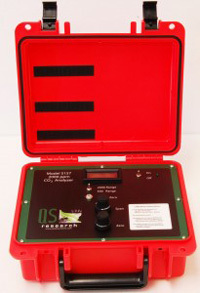 This CO2 Analyzer is ideal for CO2 exchange measurements with leaves, insects, small animals or organisms with a low metabolic rate. It is also excellent for measuring soil respiratory activity in the lab and field. The analyzer may be used in a flow-through gas exchange configuration for instantaneous and continuous measurements of CO2 exchange. It can also be used in stop flow or closed system modes for measurements at extremely low activity levels. The S157 CO2 Analyzer shares the same infrared technology and modular design as the S158 CO2 Analyzer. The S157 CO2 Analyzer may also be used as part of Qubit Systems’ carbon dioxide control system for regulating pCO2 in growth cabinet. We recommend using S157 with our C950 Gas Exchange Software or other data acquisitions software. R. F. Krachler, R. Krachler, A. Stojanovic, B. Wielander, and A. Herzig. Effects of pH on aquatic biodegradation Processes. Biogeosciences Discuss. :6, p491–514 ( 2009).